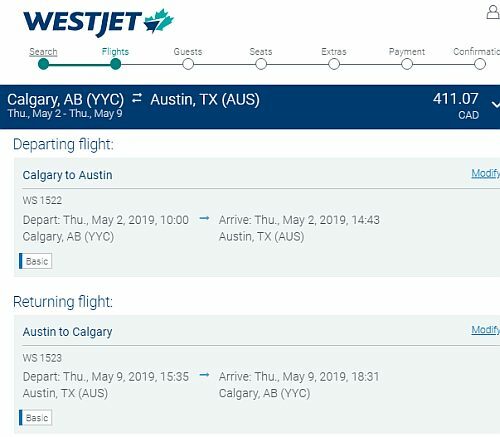 WestJet has added non-stop flights from Calgary to Austin, Texas and Portland, Oregon to their lineup. These are the first ever non-stop flights from Calgary to Austin, Texas (AUS). Calgary already has non-stop flights to Portland, Oregon (PDX) with Air Canada. Both of these new flights are seasonal, operating from May to October. Calgary to Austin, Texas (AUS): The non-stop flights are twice a week, try Thursday and Sunday dates. Calgary to Portland, Oregon (PDX): The non-stop flights are every day of the week. The prices aren't too exciting at the moment. The cheapest flights to Austin are around $411 roundtrip. The cheapest flights to Portland are $370 roundtrip, about the same as Air Canada. Update 1/30 - WestJet has dropped the price of their new non-stop flights from Calgary to Portland, Oregon (PDX) down to $240 CAD roundtrip, including some dates in July and August. See update below. ^^ The non-stop flights are twice a week, try Thursday and Sunday dates. NOTE: Google Flights hasn't quite loaded all of these yet. You can also search for them directly on WestJet's website. Update 1/30 - WestJet has dropped the price of their new non-stop flights from Calgary to Portland, Oregon (PDX) down to $240 CAD roundtrip, including some dates in July and August.